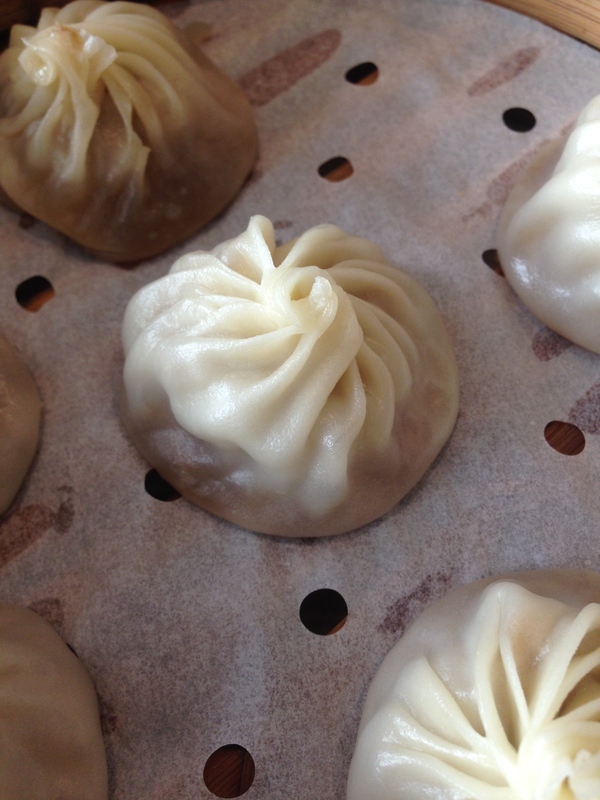 Much has been written about the famous Din Tai Fung. It is famous having begun in Taiwan, having a long presence in Sydney, and now recently taking up residence at the top of Melbourne’s most beautiful shopping centre, Emporium. It’s not dirt cheap, but at these prices pretty much anyone can have a try, and the reaction is intriguing to me. My modus operandi, besides using weird words that no-one understands, is to not look at reviews in-depth about restaurants until I’ve tried them, which is an impossible task with DTF given the huge amount of press. What I learned in my reading is there are some signature dumplings I need to try, that you have to wait a short time to get a table, and that there are a lot of people who have taken issue with DTF, leading to a Zomato score of a lowly 3.0 out of 5. To give an idea of why that is not ideal, there is a filter to hide places under 3.5! However, when you look at the reviews only by bloggers, there is an entirely different story of 4.5s and 5s out of 5. Why is this the case? I’m not absolutely sure but it was front of mind as we started to eat our way through several types of dumplings following a leisurely stroll into the city. My first thought is there is a cost aspect where DTF is far more expensive than the average dumpling place. When you have such rich and complex flavours bursting through the crab roe and pork soup dumpling, with a wrapper screaming perfection, the $17 for 6 of them doesn’t bother me in the slightest. But it isn’t cheap. 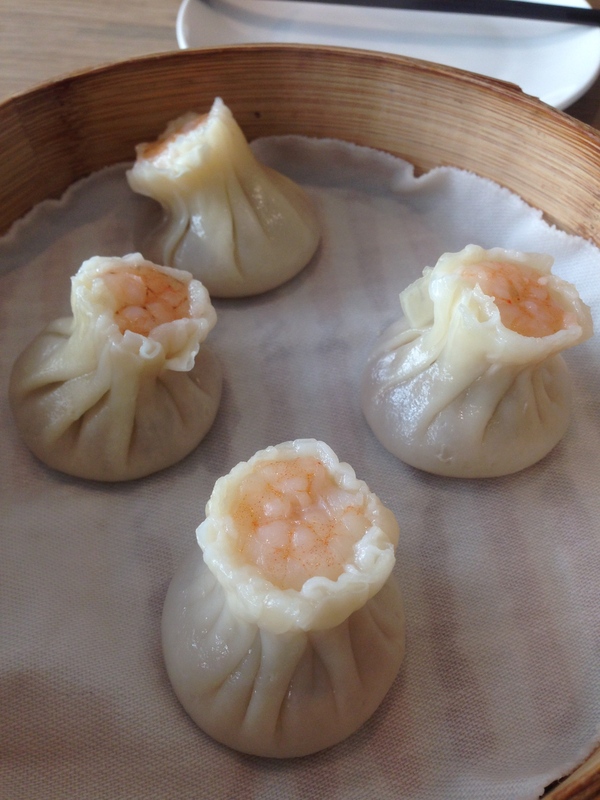 Again, the prawn and pork shao mai are carefully formed, with delectable broth combining with the firm texture of the wrapper making a meal that is revered by most, for good reason. Sure, you do not need a dozen chefs in a relatively spacious kitchen, with years of experience, to make a dumpling that is comforting and full of flavour, but you do need that if you want something just that bit more special. The same goes for most food. Teenagers can cook you a burger at Macca’s, so why would anyone pay extra for Huxtaburger, or an even more expensive burger? 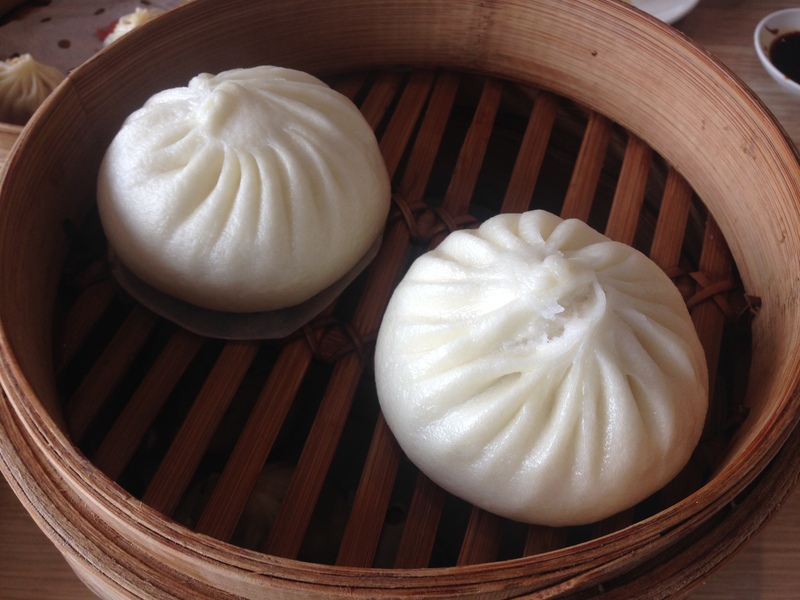 While I need to try a few more places, in my experience, the only dumpling house in the city that can match what we are eating is HuTong, which has always been exceptional, especially for their shao long bao soup dumplings. The ones we tried at DTF are just as gorgeous. The pork buns are very good, but not at the level of the dumplings. 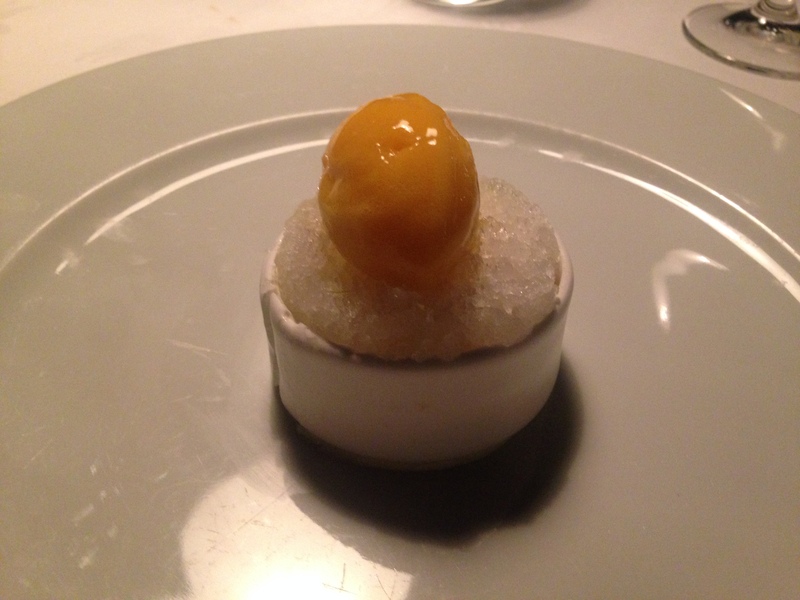 The surprise though was the simplicity, good level of sweetness, and sound technique in the reasonably priced desserts of mango pudding with fresh mango, and black sesame ice cream. I strongly suggest leaving room! 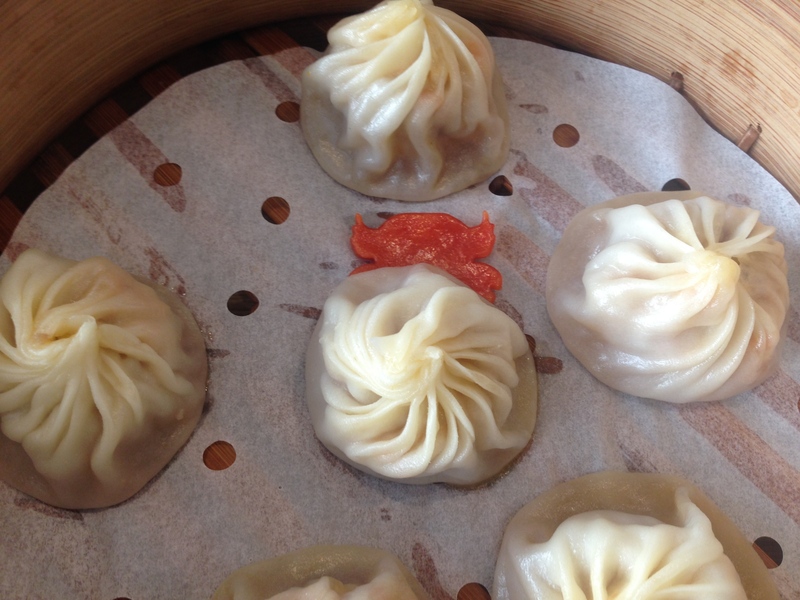 There is plenty of conjecture about the merits of Din Tai Fung. I am pleased to say that our particular experience was excellent and at around $30 a head we will be back for plenty more! There are not many people I’m completely comfortable with choosing where I am dining. There are times where Catherine and I will sit in a hotel room for close to an hour before we have decided. It is that care about food that means we rarely have a bad meal, but it does cost us time, and it is obsessive. Tonight, we are in trusted hands. My mate is introducing us to his new girlfriend and it is naturally his pick. He has good taste in food, and if there is ever a time to pick the right place it is early in a relationship! It helps that I know he has trusted advisers (ie guides and a good grip on the latest and greatest). We finish drinks at Bad Frankie (we’ll be back for the jaffles at some stage) and there is a bit of surprise as we enter Hell Of The North. Fitzroy is grungy. There is amazing food on offer, but it is often very casual. This place has Hell in its name, but there is nothing reminiscent in the look and feel of this restaurant that in any way speaks of Hell. In fact, the space is designed beautifully, with a mix of heritage style from the building, and new world comforts, that are smartly put side by side. There is a large bar and we are on the left side that feels a more intimate space, but looking around and walking through the back, it seems they have managed to get that type of feel across the restaurant. After the maitre’d giving me a metaphoric slap for suggesting some restaurants take diners more seriously when they decide to have sparking water (rather than tap) we have a bit of a laugh and we are on our way. As you would expect from that interaction, service continues at a good quality through the evening. It is for this reason that we put ourselves in the hands of the restaurant to select what we eat ($65). 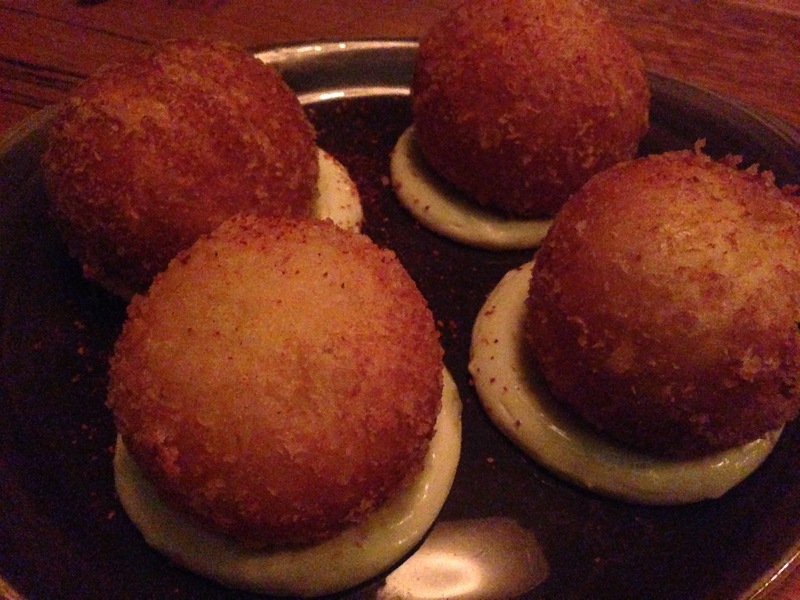 To begin we try the brandade doughnuts, and rabbit, pork and black garlic terrine. 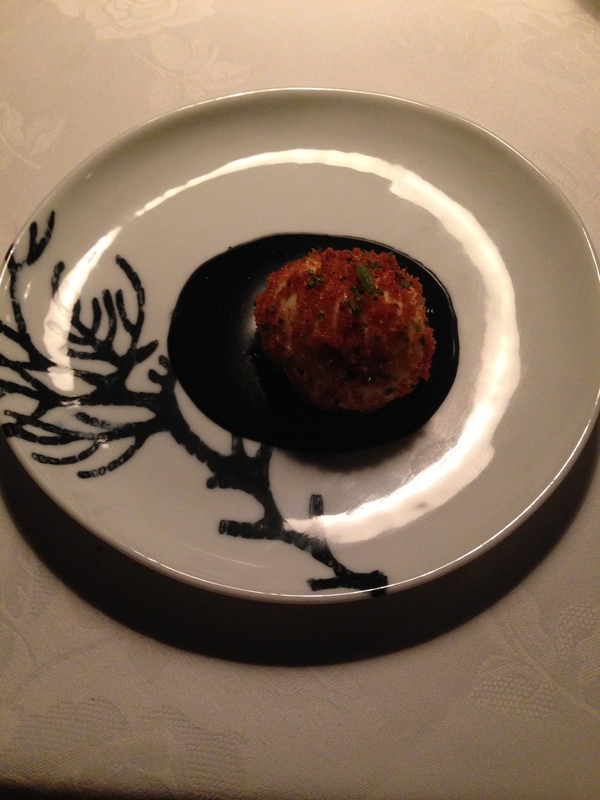 Brandade is a combination of potato, baccalau (salt cod), garlic and olive oil, but in this case comes served with squid ink in the confines of a beautifully fried doughnut. It’s a start you would have to repeat on any future visit. The terrine is also excellent quality, but there is no slant on this classic. 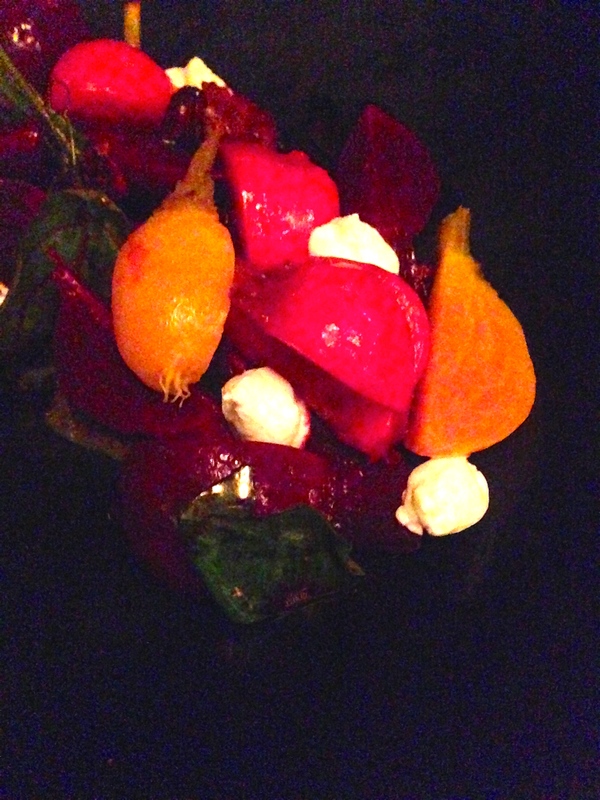 Next we are served a variety of baby beets with sheep’s milk curd, and particularly delicious candied pecans. I am waiting to become sick of beetroot dishes and have decided they are so simply incredible (subject to produce) that they are less of a fad, and more of a genuine modern classic. 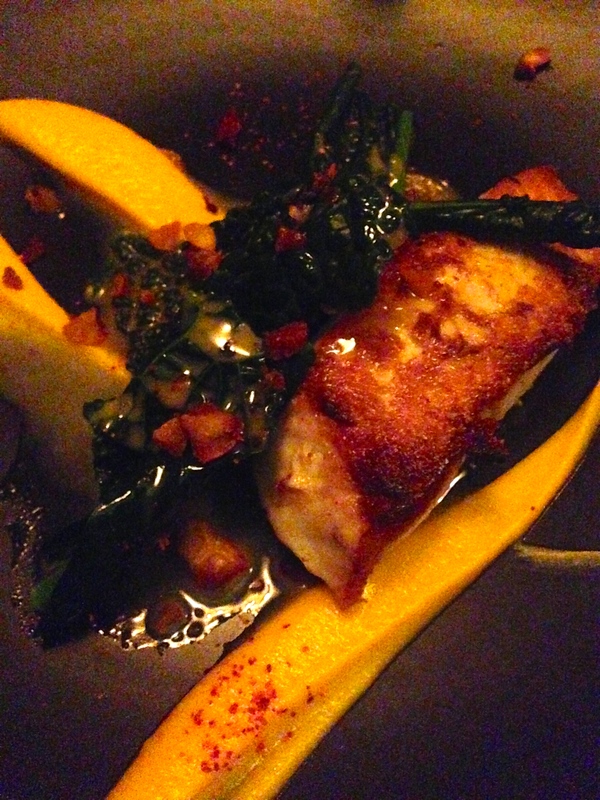 We also get served a nicely grilled snapper dish. 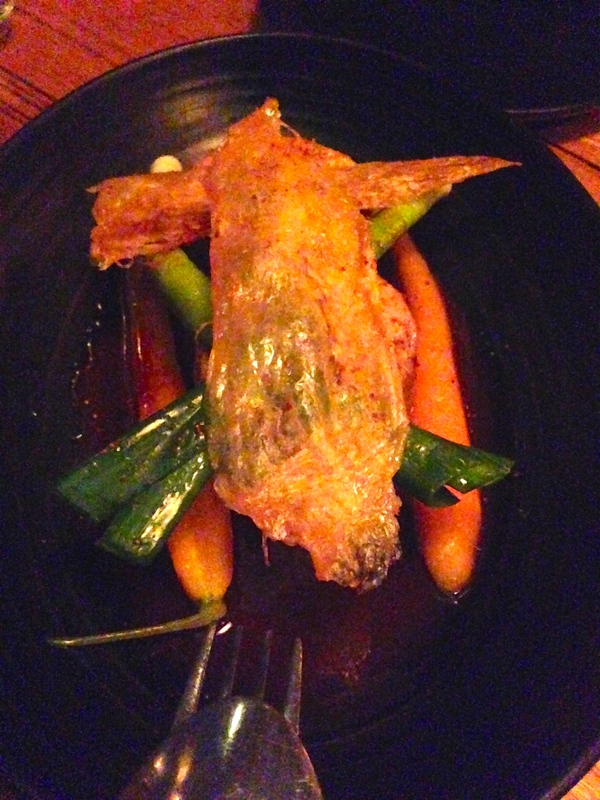 For our main dishes we are presented with a great looking chicken dish featuring crisp chicken skin on top of perfectly cooked juicy chicken, with carrots, and a jus that we were going back for. It was at this stage that I started thinking it would be good to have just slightly bigger servings between the four of us. Not that the amount overall was too little, just some of the dishes were ones that you could have more than a few bites. The bavette of beef was a good finish to the savoury courses. Stacked on plenty of potato puree and soaked in a great tarragon sauce, this was a filling course. Also known as flank steak, bavette is not quite as tender as other cuts, but has excellent flavour when treated right, and this one is very nice. The Coonawarra cabernet sauvignon we are drinking has some good structure to go with the beef too. We had a couple of desserts, but the creme brûlée was the definite highlight. Served in a shallow wide dish for extra toffee goodness, renditions like this one show there is always a need for the classics. While much about tonight’s meal was unexpected, surprises like what Hell Of The North dishes up are extremely pleasant. 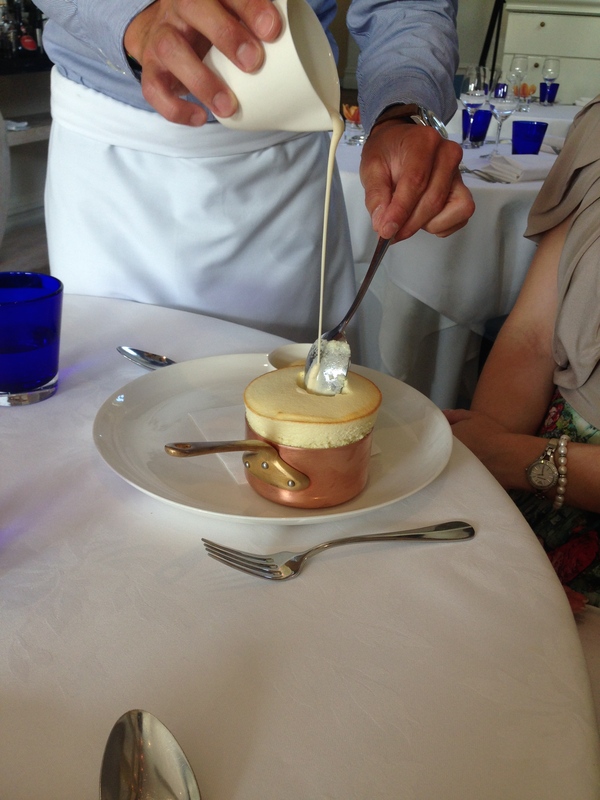 Next time I would probably order a la carte to focus on a few dishes, but trying a broad spectrum did deliver some benefits, most notably the brandade doughnuts to start, and the brûlée to finish, both of which I may not have ever tried. Yet another reason to get to Fitzroy regularly. Fifteen years is a very long time by any measure. Restaurants do not enjoy anywhere near the average life span that most of its customers do. So coming back to a restaurant after fifteen years between meals is rare. Early in this millennium I ventured to the Rocks in Sydney to enjoy, at the time, one of the very best meals of my life. Incredibly new to this echelon of fine dining in Sydney, I didn’t even realise the table next door featured the man himself, Neil Perry, until I was reading the Qantas magazine on the way home to Perth. Not many men have a ponytail like Neil’s and I was a fan having only recently cut my own long hair off! It was unmistakably him. Rockpool is no longer in the Rocks, but is close by on Bridge Street, a few streets behind Circular Quay, in an old building that is quite breathtaking. While my last visit was long ago, Rockpool has actually been going since 1989 (which has been added to the name to ease the confusion from the similarly named Bar & Grill). That is unique for any restaurant, but this isn’t a family restaurant in the suburbs, this is one of Australia’s consistently best, and most expensive. Reinventing and changing is required for any going concern to continue with the enthusiasm of youth. While Rockpool matures in experience, I’m fascinated by the creativity on the plate, and the energy of a relatively new location. The reverence to the food is now matched by the splendor of the room, dominated with magnificent arch windows, not needing any dressing up to reveal their beauty. We are dining upstairs and there is cast iron, dark wood, and excellent lighting on the tables, revealing the food, but still keeping a high level of intimacy. It needs to be a big night out as there simply isn’t the access to funds for most of us to come here as much as we’d like. Eight courses (plus the usual surprise extras) costs $185 and then wine, whether matched, or by the glass (like we chose) is not cheap either. I remember some of the flavours and ingredients from my first visit many years ago, but the refinement of how some of those same ingredients are used is stunning. 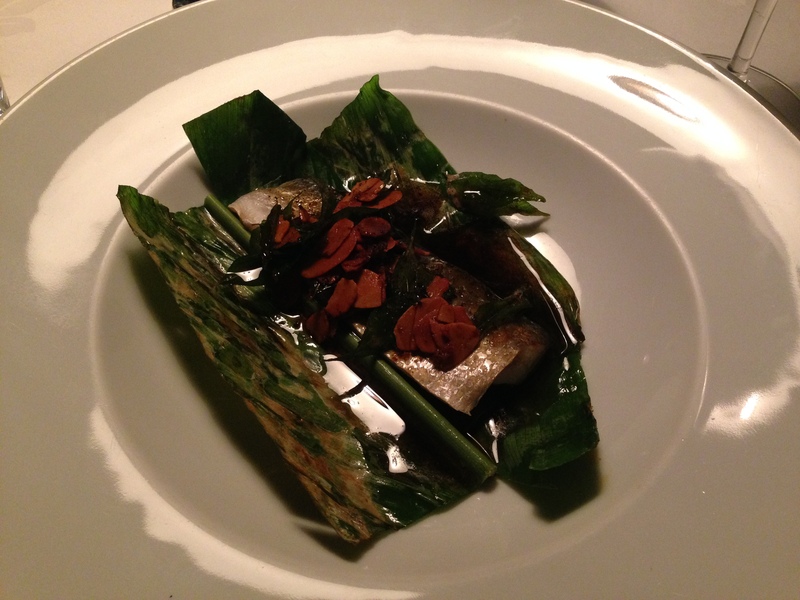 One of our favourite dishes during the night was mullet wrapped in a turmeric leaf, with a burnt butter, curry leaf, and almond sauce. Part of the taste was familiar like burnt butter and sage on gnocchi; and part of the taste was surprising as if you had discovered a secret combination. How could this perfectly cooked fish go so well with this sauce? There is a beef dish using nine score wagyu that is as good as beef can possibly taste, combined with another sauce using oxtail that is reminiscent of teriyaki, but different in a way that makes you pine for this sauce the next time you go back to usual, tried and tested. Mirin and Japanese peach dressing surround generous pieces of kingfish sashimi, the effect of the oily sauce perfect both in presentation, and then to flavour each taste. The familiar texture of Chinese dumplings are captured in a ball of prawn pieces, and eggy prawn mousse, wrapped in delicious crumb, sitting on a squid ink sauce. These are magnificent dishes. There are some dishes that don’t hit the same heights but are certainly well above average. The first was the smaller size dish of scampi and gooseberries which is sitting in a herb sauce that is a touch too strong for me. The other one was the goose which is beautifully cooked, and rolled in Asian spices, but just doesn’t have the same impact as other game could. I did enjoy the hot, sweet and sour sauce though. 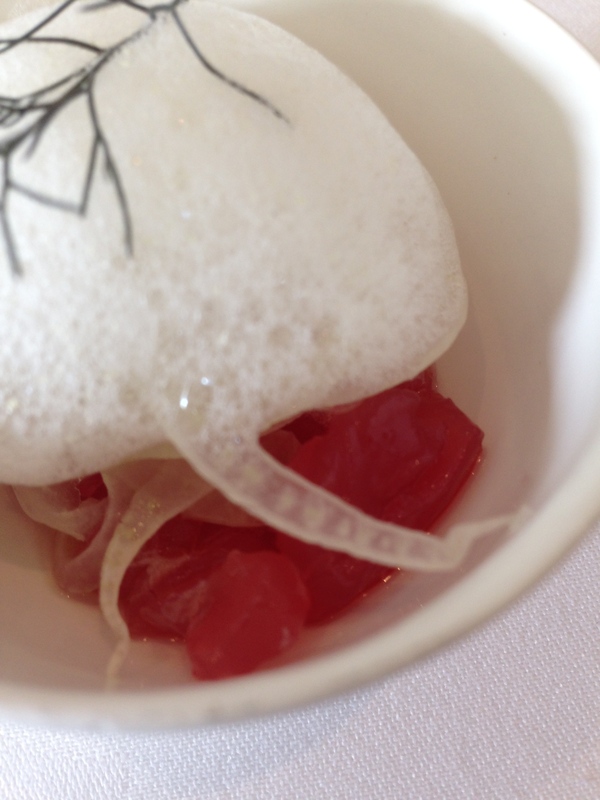 Besides the excellence in the food, two aspects stood out during the savoury courses. Each waitperson provided professional and friendly service, but the performance was disjointed as a team effort. There were some amusing issues such as getting the hot towel at the beginning of the meal twice from two different floorstaffers. There was also a lightbulb that needed changing on another table which was a little awkward considering all the lights were connected by the same wire, meaning for a few minutes it was more like a disco! Nothing that occurred took away from the evening, but it would probably cause management and Perry to cringe a little. The other aspect to note was the brilliant wines on offer by the glass. Having started off with a West Winds Sabre G&T we were then recommended a Grüner Veltliner from Canberra which was a good match and something interesting to try. The wine then got to a very high level of quality with Catherine’s Cobaw Ridge Chardonnay from Macedon and my Marsanne/Roussanne blend by Yeringberg which had some age to really lift its impact with the mullet. 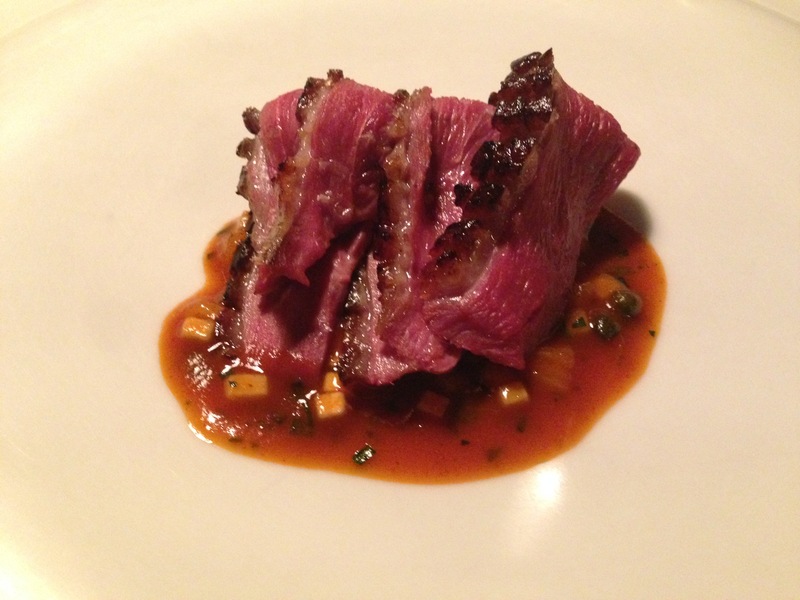 With wine service so prompt on each occasion, we decided to order a glass of the Nebbiolo as our goose hit the table. After waiting, and then slowly enjoying each bite, we finished the dish before the staff found the wine (we could see several looking around the upstairs bar). While it left the sommelier less than impressed having finally found the wine, we decided to change our order to a Garnacha/Mataro/Tempranillo from the Great Southern region of Western Australia. 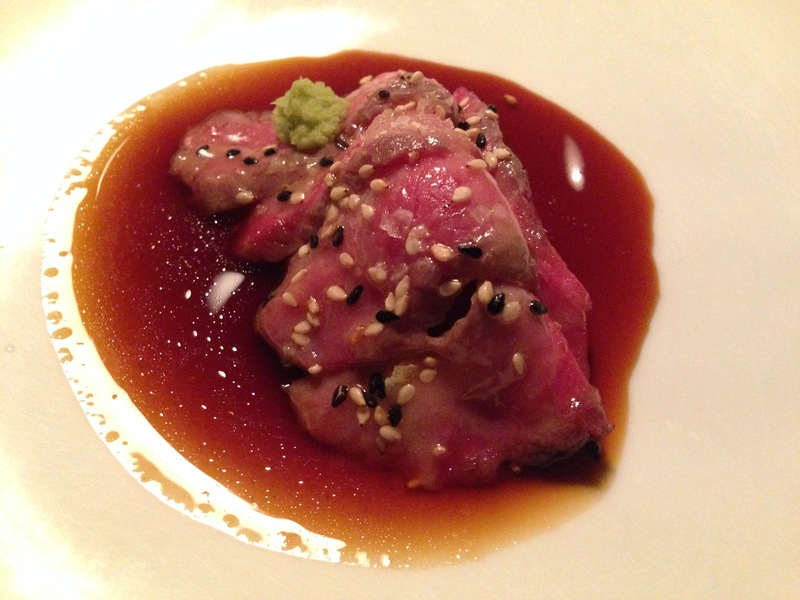 It was amazing with the wagyu and we did the right thing stepping up from the lighter red. It was time for dessert and they could not have been more impressive. To begin, mango sorbet sits atop a stunningly presented meringue wrapped around lime granita, coconut, peanuts and pandan custard. In an age of less sweetness in desserts, finally we were eating a dessert with a savoury edge, but still with a level of sweetness that you need after a great number of savoury courses. 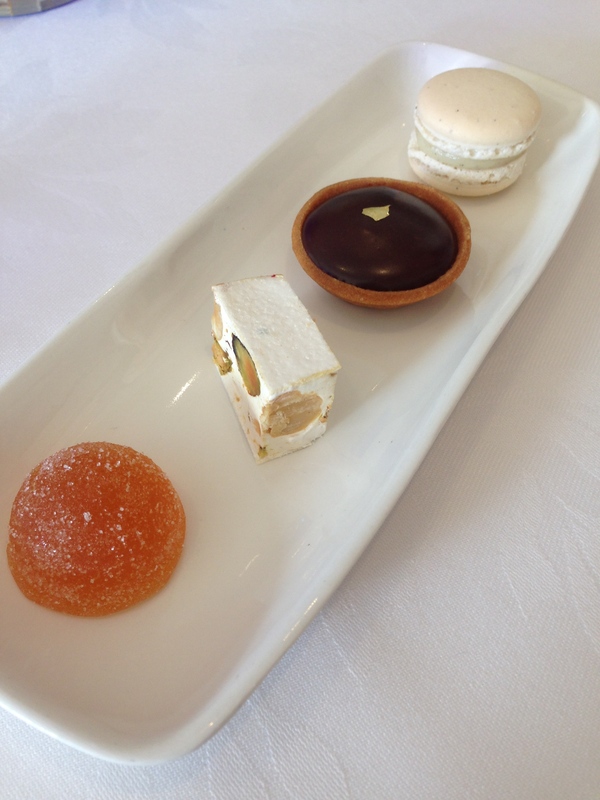 The combination was absolutely delicious with all flavours having their time in the sun. 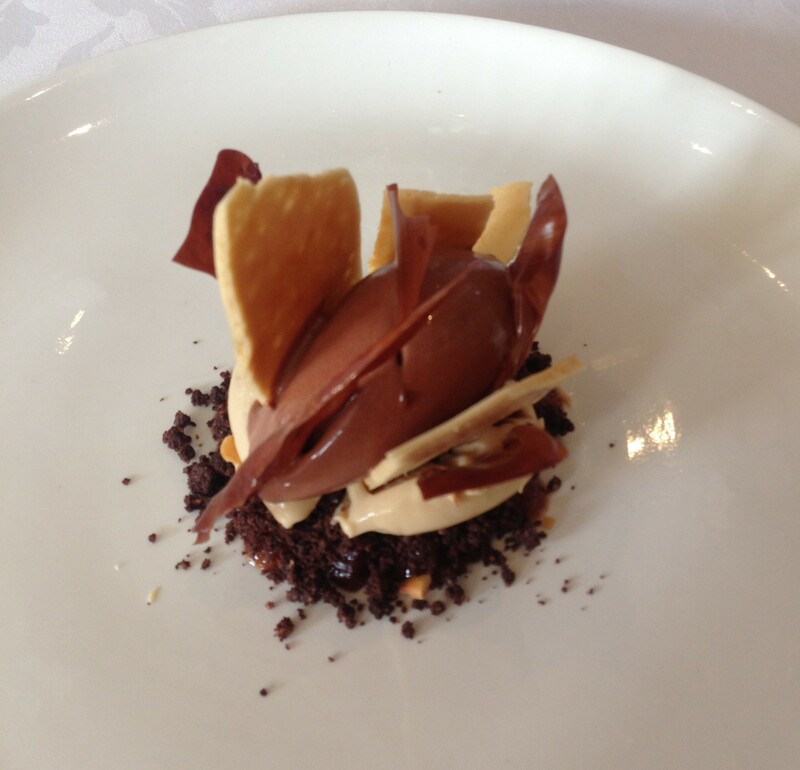 Presentation doesn’t get much better than the Valrohna chocolate dessert. With so many technically challenging elements coming together, this dessert was photogenic like no other dish of the night, the glass shard glistening next to the malt and peach leaf ice cream. We were not done with, ending the night with petit fours in the form of a delectable date tart that is apparently a signature of years gone by at Rockpool, and a macaroon with white chocolate. There were some astounding moments tonight. The precision in technique and execution shown in many of the dishes we tried must be put down to years of refinement, and an obsession with perfection. While that same attention to detail was not exhibited in all aspects of the experience, it is plain to see why Rockpool is spoken about in terms of the best Australia has to offer. What better way to plan our next trip to Europe than in a beautiful dining room in Paddington, with the charm of provincial France? French food in Australia was once so cliched to the point of being stale, but modern expressions are anything but dull. For many years, Guillaume Brahimi has been elevating the cause of French dining in Australia. The wow factor you have from dining in the Opera House is gone, left in the wake of a luxurious part-French, part-Hamptons house. I only tried the Opera House version once; an experience that provided enough great moments to merit today’s Sunday lunch. 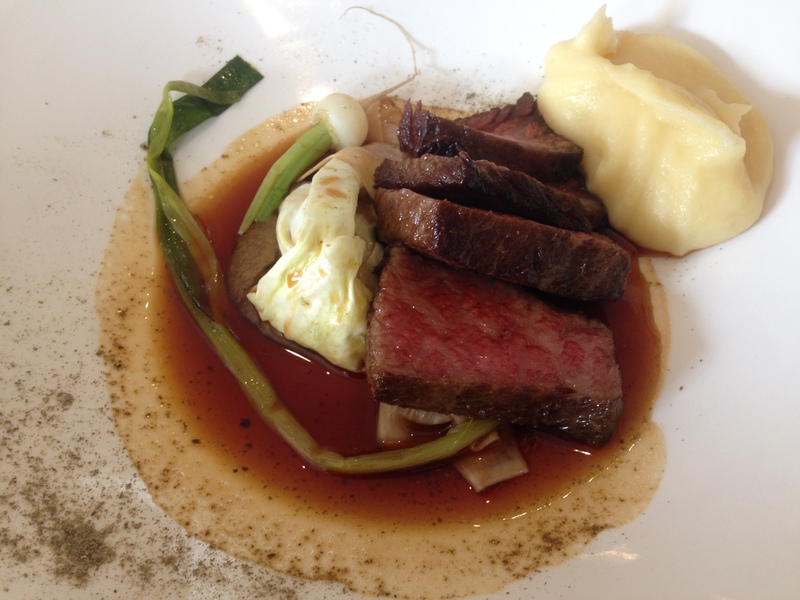 Sunday lunch is only offered at Guillaume on the first Sunday of each month. There is a five course set menu with a choice of two desserts for $150 a person. The diners here have come for more than just the food, it is a glamorous feeling and there is an atmosphere of excitement. This feeling in the dining room requires a start of Champagne and Perrier Jouet seems just right. Luckily it goes beautifully with the amuse bouche, which is a delicious diced tuna concoction complete with foam for a bit of pizzazz. 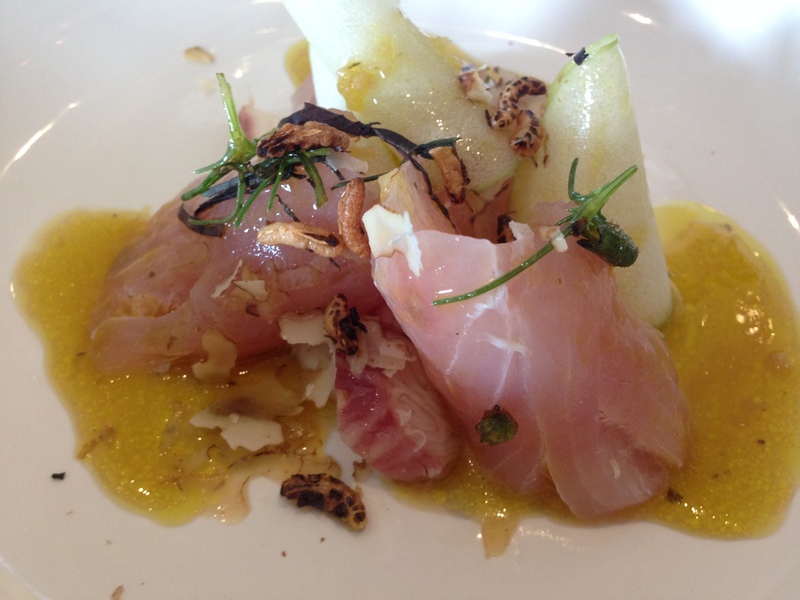 Next up is our first course of Kingfish from Bateau Bay with smoked eel, shiso, walnuts and apple. Guillaume spells out where each star ingredient is from, and it shows the care and pride taken in his approach to sourcing. Looking at the size of this dish we take a deep breath knowing we probably should not have eaten breakfast, and a bircher muesli at that! 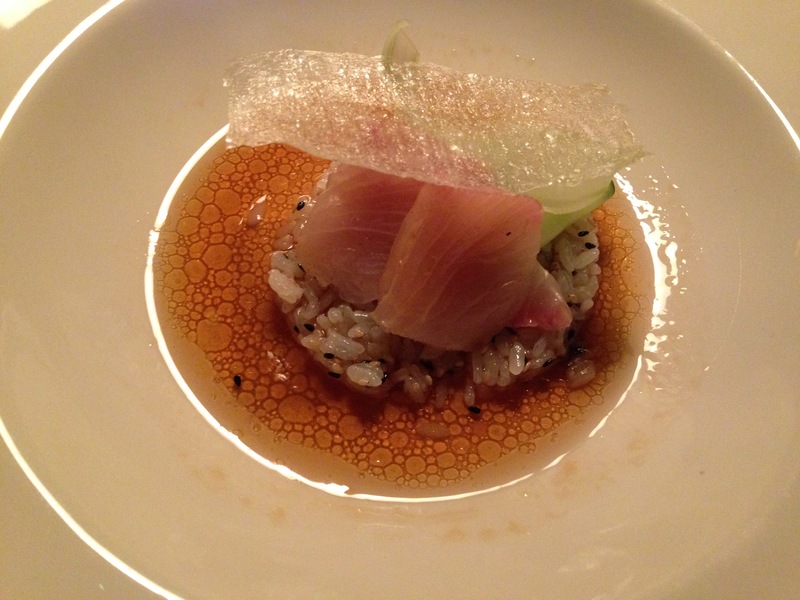 In any case, each bite of the generous portion of kingfish is delicious and the combination with smoked eel works along with the classic apple and walnut flavours, and a gorgeous lemon sauce. If nothing else, a touch more apple for each bite would be good, but this is a fantastic start to the meal. 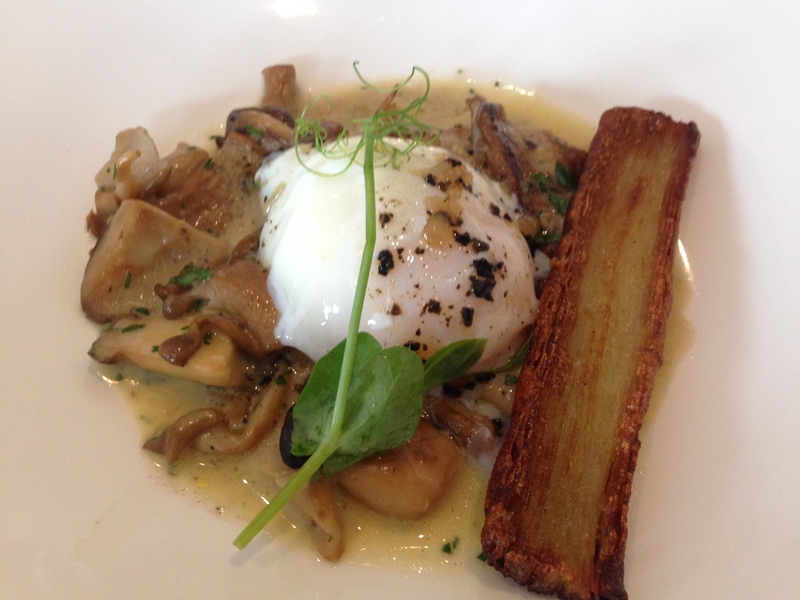 With that positive start behind us we go on to the “Hens of the Woods” dish of intrigue. Catherine and I had been talking about how we don’t miss the proliferation of egg based dishes during degustation menus on the Friday night. So initially the egg “oeuf mollet” from Bulla in Victoria was not overly exciting. But if any culture can prepare the perfect egg, it is the French, and when adorned with gorgeous mushrooms, truffle, and the crisp layered potato, you have a terrific dish. By this stage we had moved on to the Paringa chardonnay, which naturally suits the next course. 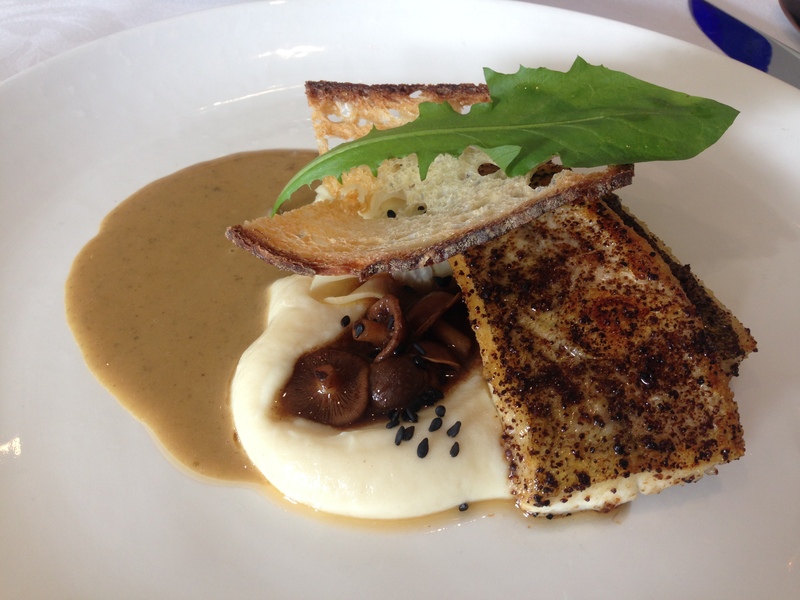 From Port Lincoln in South Australia, the King George Whiting is extremely exciting. This is one of my favourite fishes, but it needs accompaniments that lift it given its subtle flavour. The whiting itself is perfectly cooked, but the accompaniments of celeriac puree, and the sauce, whilst good, was not the quality of the previous dishes. The dish needed texture, but it was a bit fiddly with the crisp bread. There is some work to do. The next dish was something else though. 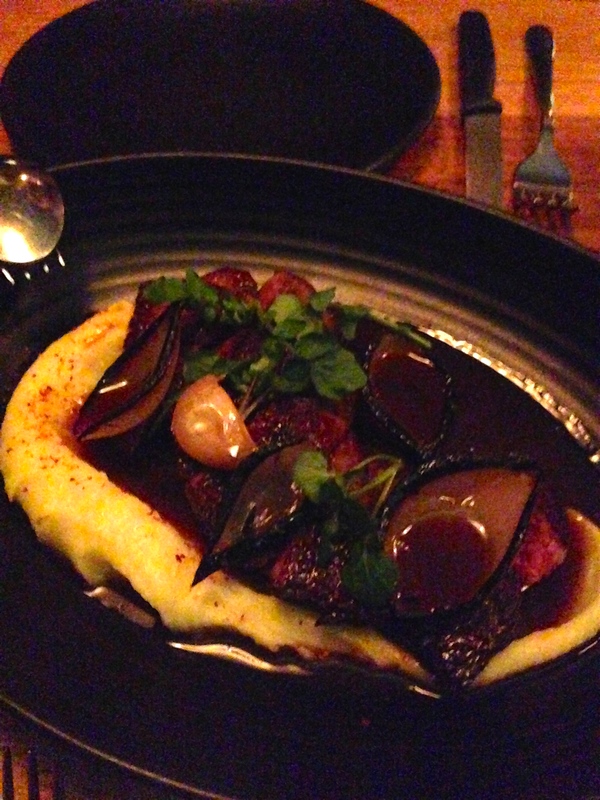 The wagyu beef from New England in New South Wales is stunning. Paris mash is served at the table from the fancy saucepan. 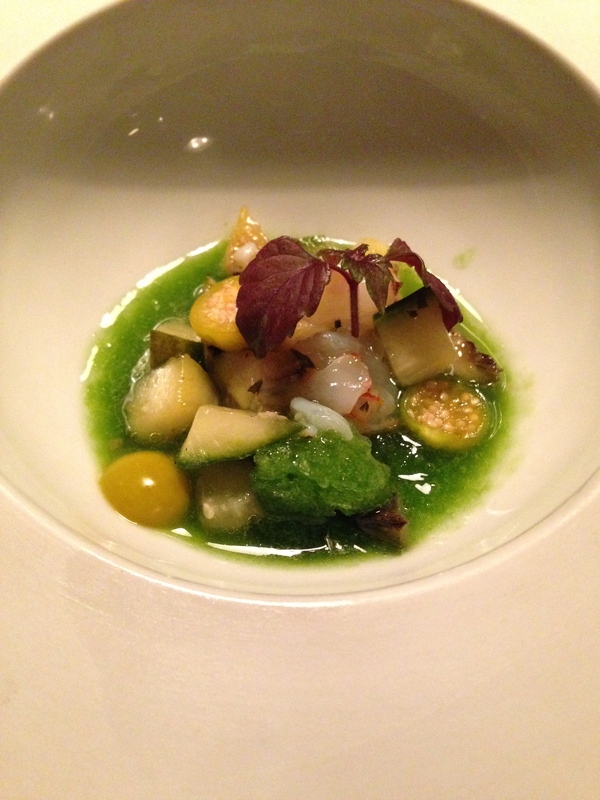 This mash and the turnip puree are outstanding accompaniments, and the jus is delightful too. Adding to the finesse of the dish is a glorious wine from Saint-Emilion combining merlot and cabernet franc in the best possible way, with just the right age to work with the beef. 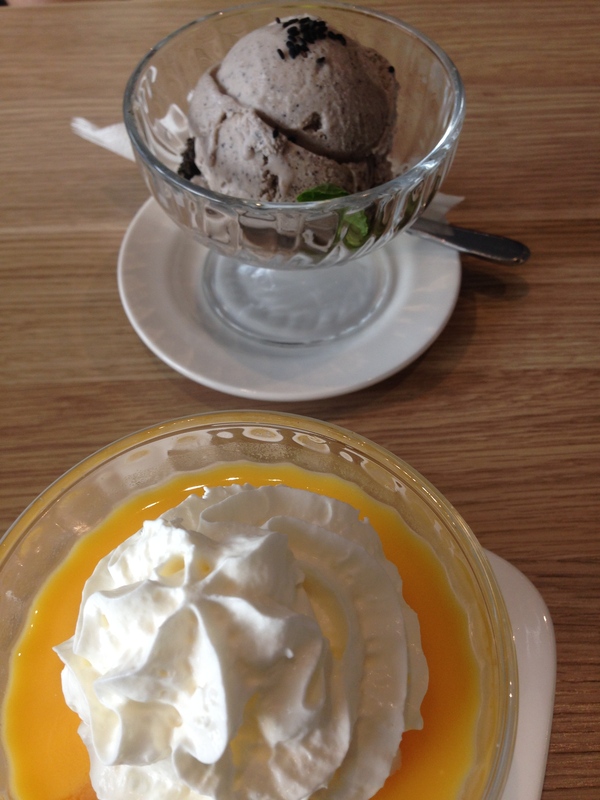 We had to try each of the desserts, so Catherine ordered the passionfruit souffle, and I chose the Valrhona chocolate. The souffle sources passionfruit from Gympie, but the star of any amazing souffle is the technique of the pastry chef. This is no exception. Add some theatre from the pouring of creme anglaise at the table and you have an exemplary performance. 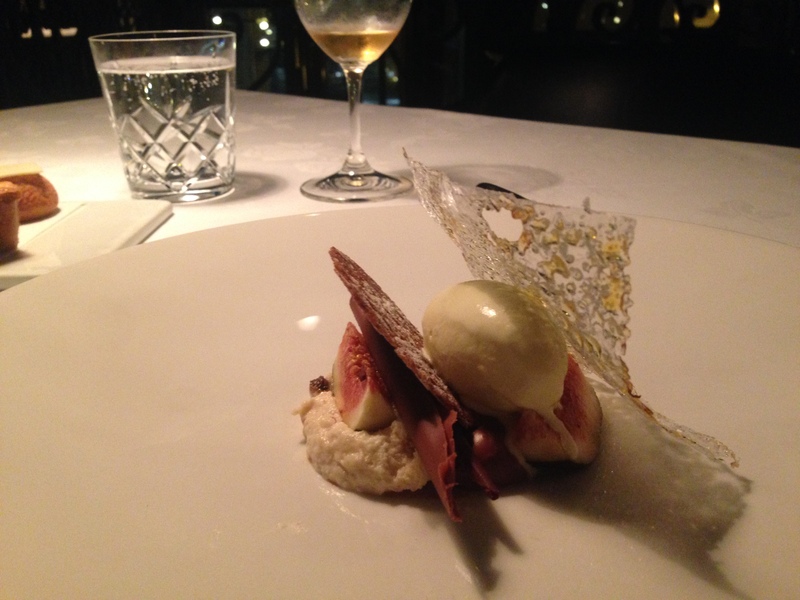 The banana and passionfruit sorbet is perfect too, adding refreshment and balance to each taste. 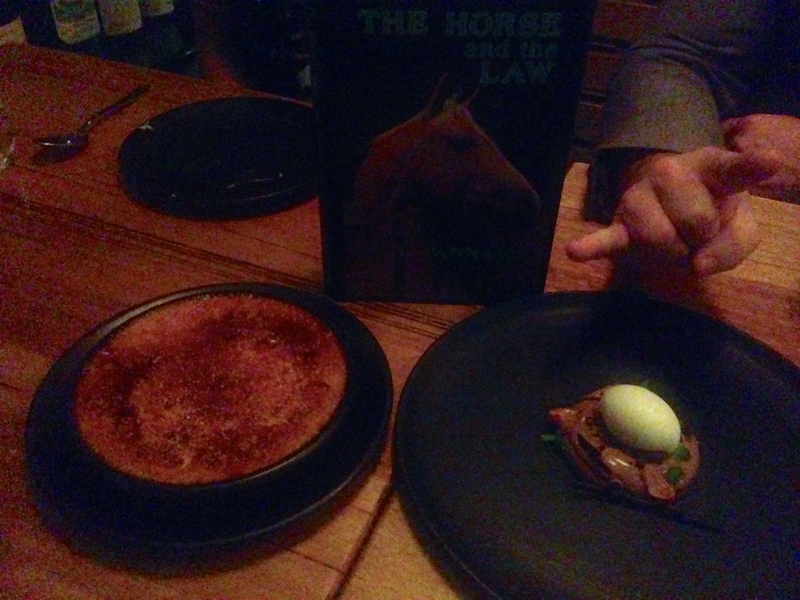 They are both different, but the Valrhona chocolate is the equal of the other dessert. The components of chocolate shards, biscuit, hazelnut cream, and textural chocolate crumb, all combine into a complete and delicious dessert. It doesn’t get more French than some souffle and chocolate for dessert, and we are perfectly fine with that! On top of this the pre-dessert was also beautiful (lychee, mango, coconut featured) and the petit fours we tried of the several offered were all fantastic! The service is performed by a mainly French staff, adding to the feel of the restaurant. On the whole the operation is seamless, but there are some minor misses, mainly with my Aussie accent, that mean there is still the opportunity to improve. However, on one particular front the staff went above and beyond, meaning small misses can easily be overlooked. To say this is a pleasant way to spend Sunday afternoon is a dramatic understatement. The servings are generous, the ingredients in the dishes are indulgent, and more importantly, work together in mostly classical ways, but with the right touches to enhance the flavour. Add some elegant wines to the mix, professional service and a dining room to remember, and you have all the hallmarks of what I love in a restaurant.